Products that are being promoted as "Sugar-free", "no-added-sugar" are on the rise. As people are getting aware of the consequences of high sugar consumption, food industry wants to tap into the new demands by launching sugar-free products. Until a few years back, only diabetic patients were seeking such products, but nowadays many health-conscious people who don't want to be trapped by lifestyle diseases are looking out for sugar-free products. Whenever I accompany my in-laws for grocery shopping, I get very concerned with the way they scout for sugar-free foods in every aisle. Be it ice-creams, jams, biscuits, cookies etc. All they would check for is the label "SUGAR FREE" on the front side of the pack. Both of them have diabetes and hypertension. They have been on artificial sweeteners for decades. The intention of this article is NOT to talk about artificial sweeteners and their ill effects per se but more about the label "sugar free" and how it can mislead consumers into buying unhealthy products. Take for example, this pack of Unibic's Daily Digestive sugar free ajwain cookies. The first two ingredients are maida and palm oil, both are unhealthy, more so for people who are diabetic. Why? Because of the high glycemic index of maida and the inflammatory properties of refined oil. Instead of sugar, this pack contains maltitol (E965). Maltitol is a sugar alcohol (a polyol) used as a sugar substitute. It has 2.1 calories per gram (white sugar has 4 calories per gram) and a glycemic index of 52 (table sugar has a glycemic index of 60). Since maltitol is a carbohydrate and contains calories, it affects blood glucose levels. Some of the side effects of maltitol include abdominal cramps and intestinal gas. It is also mentioned in the pack - "polyols may have laxative effect". To increase the fibre level, the brand has included fructooligosaccharide. I didn't understand the need for it, given that the pack already contains 7.2% rolled oats and 4.5% wheat bran. Then as I flipped to the front side, I noticed this tagline "33% daily fibre". 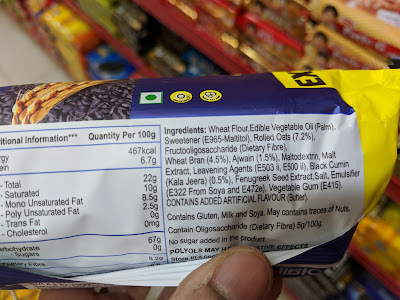 100 gm of these cookies contain 8.2 gm of dietary fibre, which is definitely on the higher side. Instead of blindly going with the "high fibre" and "sugar-free" taglines, it is imperative that we also look at the source of fibre. Dietary Fructooligosaccharides are a form of sugar that is naturally present in onion, garlic, artichokes, banana etc. They act as a prebiotic, as they go undigested into the intestine and feed the gut bacteria. Sounds all good but whether the lab processed fructooligosaccharides provide the same result is something to be questioned. Most sugar-free products will have either high levels of fat or salt to compensate for the lack of sugar. 100 gm of these sugar-free ajwain cookies contain 22gm of unhealthy fats. The other unhealthy additives in the form of leavening agents, emulsifiers and artificial flavors are also present. This is yet another junk masquerading as healthy. Let alone diabetics, it is not a healthy choice for fit people either. I'm listing down a few other popular brands which use "sugar-free" as their value proposition along with their respective artificial sweeteners. Let's not blindly pick such "sugar-free" labeled junk. Let's read the ingredients and understand the nutrition facts. Let me share with you a perfect example of how celebrities/influencers promote junk as "healthy" by spurting out attention-grabbing numbers/stats. As I was scrolling through my Insta feed a couple of days back, I stopped at a sponsored ad. It was from Unibic Cookies that showed a video of Shilpa Shetty making a fruit parfait with Unibic Digestive cookies as the base/crumble. This particular line in the caption caught my attention - "To give it a healthy twist, we are making this recipe using Unibic Daily Digestive cookies which has 26% fibre"
Woah, 26% fibre? seriously? I have never seen a packaged food with that high an amount of fibre. I immediately opened my Amazon app, searched for this pack and looked at the nutrition facts table. 100 gm of these cookies contain 6.1gm of dietary fibre, which means it has 6.1% fibre. So the number quoted in Insta caption is clearly misleading. I then opened the video from Shilpa Shetty's Insta page and carefully listened to what she says - "to make the fruit parfait a tad bit healthier, we are going to use Unibic Daily Digestive oatmeal cookies which has 26% fibre of your daily requirement" and then she proceeds with her recipe. 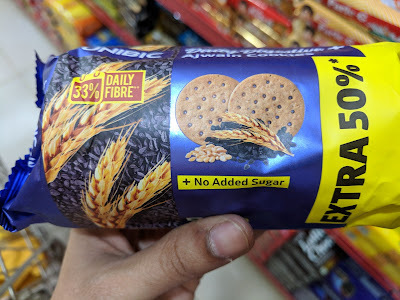 If you are going to talk about daily requirement, you would ideally say "these cookies meet 26% of your daily fibre requirement". They don't contain 26% fibre. Let's presume that our daily fibre requirement is 25gm approx. 26% of that would be 6.5gm, which means we would have to eat around 100gm of these cookies in a day to meet the 26% fibre requirement claim. I'm not sure how many cookies add upto 100gm. I'm guessing it would be around 7-8. Correct me if I'm wrong. Long story short, the fitness enthusiast/wellness influencer Ms.Shilpa Shetty (with 9.5 million followers in Instagram) claims that eating 7-8 unibic daily digestive cookies in a day is healthy because it gives us 26% of daily fibre requirement. Wheat flour, Edible Vegetable Oil (palm), Sugar, Rolled Oats (8%), Liquid Glucose, Wheat bran (3%), Milk Solids, Leavening agents (E500 ii, E503 ii), Salt, Emulsifier (E322 from soya). As expected, the first three ingredients are maida, palm oil and sugar. Rolled oats is ONLY 8%. I'm so glad that FSSAI has brought in the regulation that mandates food companies to print "refined wheat flour" for maida and not "wheat flour". How ridiculously misleading it is currently! 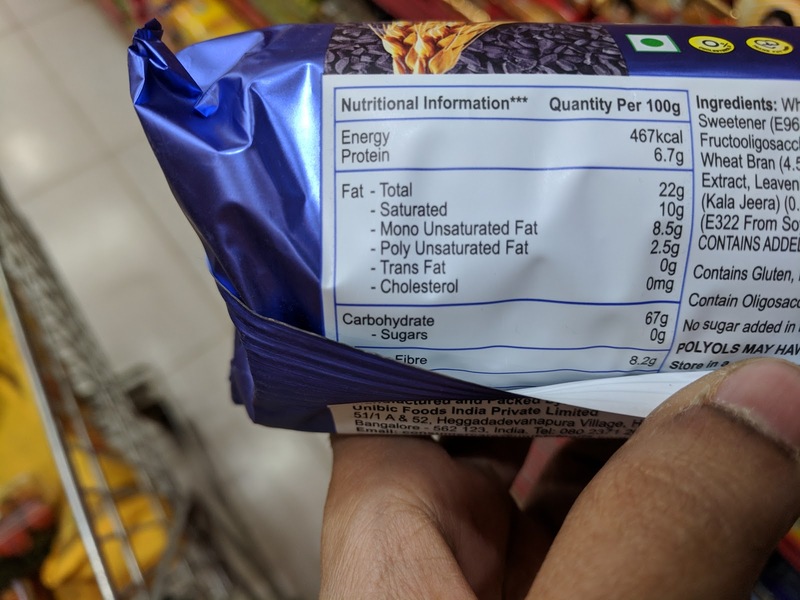 100 gm of these cookies contain 23.4 gm of unhealthy fats and 18 gm of sugar. If we eat 7-8 cookies in a day so that we get 26% of daily fibre requirement, then we are also consuming around 6 tsp of unhealthy fats and 4.5 tsp of sugar. How does this make us "tad bit healthier"? I had earlier written about McVities Digestive and Britannia Nutrichoice cookies. All these so-called "digestive" cookies are totally unhealthy and addictive because of the high amounts of fat and sugar. In this age of short attention span, it is very easy to be misled by claims made by celebrities, brand endorsers and food influencers. If someone uses "health tags" and highlights individual nutrients like fibre, protein, calcium etc, be extremely cautious. Read the ingredients list, nutrition facts table and make a conscious decision for yourself and your family. These food/fitness influencers don't care a hoot about our health. If they do, they won't be promoting such junk in the first place.